Outdoor Entertainment — Waterfront Spa & Pool, Inc. Discover great design ideas for outdoor rooms and creative options for outdoor living spaces from the experts at Waterfront Spa & Pool. We have both Brown Jordan Outdoor Kitchens and Danver Stainless Outdoor Kitchens for you to choose from. Both have lifetime warranties, extensive array of exclusive designer colors and door styles creating fully functional, signature outdoor kitchens. 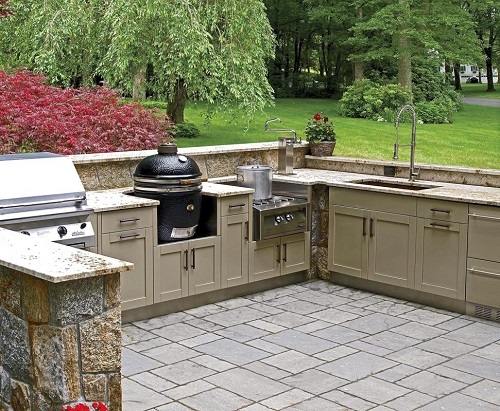 Designed to accommodate even the most creative kitchen layout, these cabinets fit any manufacturers grill as well as a multitude of other outdoor kitchen appliances, bars and accessories. Tell us why you'd like to become part of the team! Tell us what skills you have that would help you excel in this position... what you're good at and what you like to do! Thank you for your application and interest in joining our team! We will contact you soon!